First of all I would like to explain briefly the history of Tibetan Buddhism. As you know, in order to lead sentient beings from suffering and dissatisfaction to temporary and ultimate happiness, Lord Shakyamuni Buddha turned the wheel of Dharma, imparting teachings to suit the mental dispositions of disciples at different levels. He taught at different places, at different times and in different languages. Lord Buddha's teachings were later collected into the Tripitaka, or three baskets: Vinaya, Sutra and Abhidharma. Later on, extensive commentaries were written by various highly realized masters and great Indian Panditas. For hundreds of years, the teachings of the Lord Buddha spread to many countries with great success. In the 4th century AD, during the reign of Dharma King Lha Tho Tho Ri Nyen Tsen, the Buddha Dharma was introduced to the Land of Snows. Five generations later, King Songtsen Gampo formally established Buddhism as the official religion of Tibet. Another five generations after that, Dharma King Trison Detsen invited the Bodhisattva Shantarakshita and the renowned Guru Padmasambhava to consolidate the vast teachings of the Sutras, Tantras and Shastras in Tibet. These teachings are still preserved by the great masters of Tibetan Buddhism. Several generations later, in 1073, a member of the Khön family, a renowned master called Khön Könchok Gyalpo, established the glorious Sakya School, one of the four schools of Tibetan Buddhism. Since that time successive generations of the Khön family have continued in an unbroken lineage. Many famous and great masters have appeared in this illustrious Khön lineage, including the five great founders of the Sakyapa Order: the Great Sachen Kunga Nyingpo (1092-1158), Loppon Rinpoche Sonam Tsemo (1142-1182), Jetsun Rinpoche Dragpa Gyaltsen, (1147-1216), Chöje Sakya Pandita (1182-1251) and Drogön Chögyal Phagpa (1235-1280). These were all emanations of Arya Manjushri (the manifestation of all the Buddhas' wisdom), Avalokiteshvara (the manifestation of all the Buddhas' compassion) and Vajrapani (the manifestation of all the Buddhas' power). The Mongol King, King Godan Khan, Grandson of Gingis Khan, invited Choje Sakya Pandita and Drongon Chogyal Phagpa to China, where they stayed for some time. This established a Dharmic relationship between the Sakya School and the Chinese and Mongol people. Drogon Chögyal Phagpa invented the Mongol script. At the request of one of the Mongol Kings, Chögyal Phagpa became the King of Tibet. 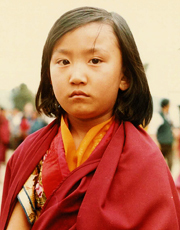 So from the inception of the Sakya School until the present, the members of the Khön family have played a very important role, particularly within the Sakya School itself, but also within Tibetan Buddhism in general. They have preserved and propagated the precious and profound teachings of Lord Buddha in many ways. They have composed numerous texts, which accurately explain the sacred and secret teachings of Lord Shakyamuni Buddha. Through composing treatises and participating in debate, they have been foremost in establishing a logical basis for belief in the teachings of the Lord Buddha. 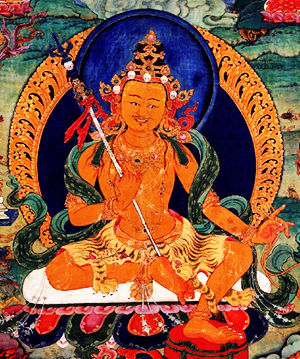 The glorious Sakya Order flourished through an unbroken lineage of scholars and Mahasiddhas. The fame of the glorious Sakya Order spread to many places. Many ancient histories and texts by great scholars of all schools describe without exaggeration or sectarian bias how their holy efforts and activities spread the light of Lord Buddha's precious teachings. My Noble Father, Vajradhara Ngawang Kunga Theckchen Palbar Trinley Samphel Wangi Gyalpo, the Supreme head of the Sakya School (His Holiness the forty first Sakya Trizin) was born as heir-apparent of Vajradhara Ngawang Kunga Rinchen in the Dolma Phodrang (palace) to uphold and continue the precious lineage for the betterment of sentient beings. 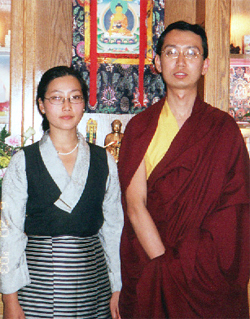 In 1974, to maintain the unbroken lineage of the Khön family, His Holiness Sakya Trizin consented to the request of many Lamas and of his own aunt, and accepted Tashi Lhakee as his Dagmo (Consort). 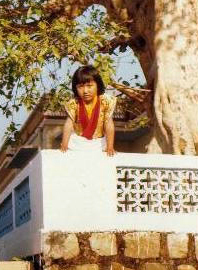 She was the daughter of a minister of the King of Dege in Kham, an Eastern Province of Tibet. Dagmo Tashi Lhakee's arrival in the Dolma Phodrang was accompanied by numerous auspicious signs. On 19th November 1974, the fifth of the tenth lunar month, at 9:10 am Indian time Dagmo Kusho Tashi Lhakee gave birth to me in Kalhan Hospital in Dehra Dun, India. Due to the Kindness of Mama Lak (mother) I was able to attain this precious human life and also I got the chance to meet many holy teachers and receive many precious and profound teachings. She is also very kind to me in many other ways. Soon after I was born, my Noble Father visited me. He performed traditional ceremonies and gave me many blessing pills. He also drew the Tibetan letter DHI (the seed syllable of Manjushri) on my tongue with wisdom pills and saffron water in order to increase my knowledge and wisdom. On November 23rd I was brought to Dolma Phodrang for the first time. Noble Father performed rituals and Initiations on me, and also gave me my name Ratna Vajra. I received a traditional welcome from the assembled monks and lay people. Thereafter I accompanied my Noble Father, Mama Lak and entourage to Lumbini, the birth palace of Lord Shakyamuni Buddha. There, after my Noble Father had a discussion with Kyabje Chogye Trichen Rinpoche, they decided to give me the formal name of Ngawang Kunga Lodroe Wangchuk Rinchen Jigmed Trinley, which is a combination of the names of Noble Father's root Gurus and the Gurus of the Dolma Phodrang. Based on this, Kyabje Chogey Trichen Rinpoche wrote a long-life prayer for me. We then visited Boudha in Nepal. On 29th of the second lunar month, the anniversary of Jamgon Loter Wangpo, I had a traditional enthronement ceremony at H.E. Tharig Rinpoche's Monastery. I was about five months old. During that time my long life prayer was chanted for the first time. While they were chanting the long life prayer, one of the people offered me a biography of Vajradhara Ngorchen Kunga Sangpo written in gold. I was fortunate to receive this holy biography without prearrangement on this occasion. On 5th June 1975, my Noble Father gave me refuge vows in front of the precious image of Lord Buddha. In 1976, I visited Darjeeling, Ladhak and South India with my Noble Father and Mama Lak. In 1977, I visited overseas countries for the first time with my Noble Father and Mama Lak, travelling to South East Asia, Europe and North America for more than 16 months. When I was in these countries I started to speak the English language but could not read English words, at that time. Since then I have accompanied my Noble Father to many places within India and abroad, such as Australia, Austria, Canada, England, France, Germany, Hungary, Italy, Malaysia, Monaco, Nepal, Netherlands, New Zealand, Scotland, Singapore, Spain, Switzerland and the United States of America. 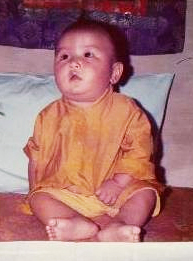 On fifth July 1979, the tenth of the fifth lunar month, the anniversary of the birth of Guru Padmasambhava, my younger brother Dungsay Gyana Vajra Rinpoche was born with auspicious signs. In the morning of the 3rd October, after a traditional ceremony to mark the beginning of my formal education, Noble Father gave me the reading transmission of the homage to Manjushri and taught me the Tibetan alphabet etc for several months. In 1980, my tutor Gelong Rinchen Sangpo arrived from Kalimpong. He taught me reading, writing, history and grammar etc for many years. He was very kind to me and put a lot of effort into helping me to gain knowledge. On the 14th day of the 11th lunar month, the auspicious day of Jamgon Sakya Pandita's anniversary (20th December 1980), I began to receive the cycle of the precious Uncommon Lam Dre teachings from my Noble Father for the first time together with many high Lamas, Tulkus, Abbots, more than 700 monks and nuns and about 500 lay followers including many from overseas, at Sakya Thubten Namgyal Ling monastery in Puruwala, India. On 10th October 1981, I gave my first oral examination in the presence of my Noble Father, my tutor and prominent members of the Sakya Center on Remembrance of the Triple Gem, Three Heap Sutra, Confession Sutra and extended Lineage Guru's prayers etc. 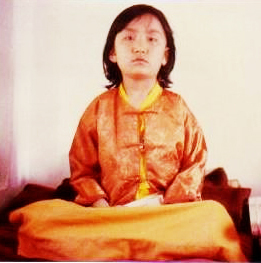 Since then I have given several oral examinations, including the oral examination in which I had to lead a special ritual in the Sakya Center. In 1986 I did my first retreat together with Mama Lak. On 14th January 1987, I began to learn the ritual melodies from my Noble Father. In 1990, I joined Sakya College and studied Buddhist philosophy mainly under Most Venerable Khenpo Ngawang Lekshey Kunga Rinpoche (late Khenpo Migmar Tsering) for many years. I received the Kachupa Degree, which is equivalent to a BA degree. I have received many exoteric and esoteric teachings, such as empowerments, blessings, initiations, oral transmissions, explanations and pith instructions from my Noble Father. I cannot express in words the kindness and the guidance that he has shown to me. It is inexpressible and unimaginable. He is my root Guru, my Buddha, my Deity, my Dharma and my Sangha. I have also received many sacred and secret teachings from many Vajradharas, such as His Holiness the 14th Dalai Lama, Kyabje Chogey Trichen Rinpoche, Kyabje Luding Khenchen Rinpoche, Kyabje Dungsay Gyana Vajra Rinpoche, Kyabje Luding Khen Rinpoche and Late Kyabje Deshung Rinpoche. The great Jamgon Lama Sakya Pandita said that the one from whom one has received the uncommon Mahayana teachings is one's real Buddha. So these great masters are very holy to me. 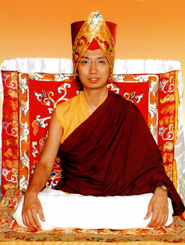 From the great scholars and most venerable Khenpos of the Sakya school, such as Appey Khen Rinpoche, Khenpo Kunga Wangchuk Rinpoche, Khenpo Ngawang Lekshey Kunga Rinpoche and Khenpo Lungrik Senge Rinpoche, I have received teachings on major topics of Buddhist philosophy such as Abhidharma, Prajnaparamita, Pramana, Madhyamaka and the Trisamvaraprakarana, (the famous text by Great Sakya Pandita known as Differentiation of Three Vows). I feel extremely indebted to these Masters who, with inexpressible kindness, have bestowed upon me many precious and profound teachings, more revered and rare to obtain than a wish-fulfilling jewel. I have learned the melodies of rituals and ritual percussion instruments from Ven. Nyima Woser and I have learned English language from more than ten teachers, each of whom taught me for a short period of time. So I have obtained the precious human life and I have also met and received ocean-like teachings of Lord Buddha from many great Gurus. However, due to my own lack of interest and effort, I am not a very well educated nor am I in reality a good Dharma practitioner. This Autobiography is based on the better part of my life story. I wrote this in October 2001 and it was edited by Mr. Tsering Migyur. This was revised in June 2002 in conjunction with Dolma Lhamo.